What was happening to the nameless sister? Was Sarah really a vampire attacking her in the night? Or was the poor girl suffering from sleep paralysis, perhaps exacerbated by sadness over her sister’s death? Or was it something else? Many skeptics would immediately say that it’s a case of sleep paralysis, perhaps accompanied by hypnagogic or hypnopompic hallucination. During sleep paralysis, the brain is conscious or on the verge of wakefulness, but the body remains locked down. In addition to the paralysis, the sufferer may experience vivid and frightening hallucinations. These frequently involve an impression of a presence, often hostile. The dreamer may also feel as if he or she is suffocating. Sleep paralysis is extremely common. Many people will experience it at least once in their lives. Some people experience if with some regularity. The experience can be terrifying and the hallucinations can seem very real. Many people swear that they are awake, and, in a sense, they are–more or less. They are known, indeed, as incubus demons. They don’t do much harm, but they deceive people. They often afflict men in dreams. It goes on to say the incubi “know” women and lead children astray. Since the second half of the 20th century, the assailants have often been aliens, bent on abduction and examination. Are we, as skeptics, justified in dismissing all these stories as sleep paralysis? No doubt we often we are. Many instances almost certainly can be explained by sleep paralysis, and it seems likely that stories of night hags and night demons originated with the phenomenon of sleep paralysis, but the stories are so prevalent that they’ve moved from the world of physical phenomenon to the realm of folk tale motif. Persons who at night become nightmare. Those who are born on a Thursday and christened on a Sunday must at certain times (on Thursdays) press someone or something. were always connected with a feeling of anxiety and suffocation. The mara was believed to oppress and weigh her victim down when tormenting and riding it. There is also an undercurrent of latent sexuality more or less manifest in the mara traditions. The succuba chokes. They said that it was a child who was not baptized properly. This person walks at night and chokes others. They said that when people went to sleep it choked them. Succuba–They are unbaptized children who died before they were baptized. They come to a person and they choke a person in the night…. A succuba is that which chokes people. She could crawl through a keyhole. Someone said that, while a succuba was choking them and then they grabbed, sometimes it was like a ball of wool and then it disappeared. My brother Frank also caught one. A succuba, nightmare, also choked him. He had to sit up and not go to sleep on the pillow, so that it would come to him. He said that a man all matted with hair came to him, and he caught it. Demons, night hags, witches, ghosts, vampires and now aliens. All have attacked and suffocated victims in the night. It seems odd that we label all of these cases “sleep paralysis.” The Wikipedia entry on sleep paralysis has a section on “Folklore,” listing folktales from all over the world. A New York Times article attributes all sorts of folklore to sleep paralysis, as does a Skeptical Inquirer article by Susan Blackmore. 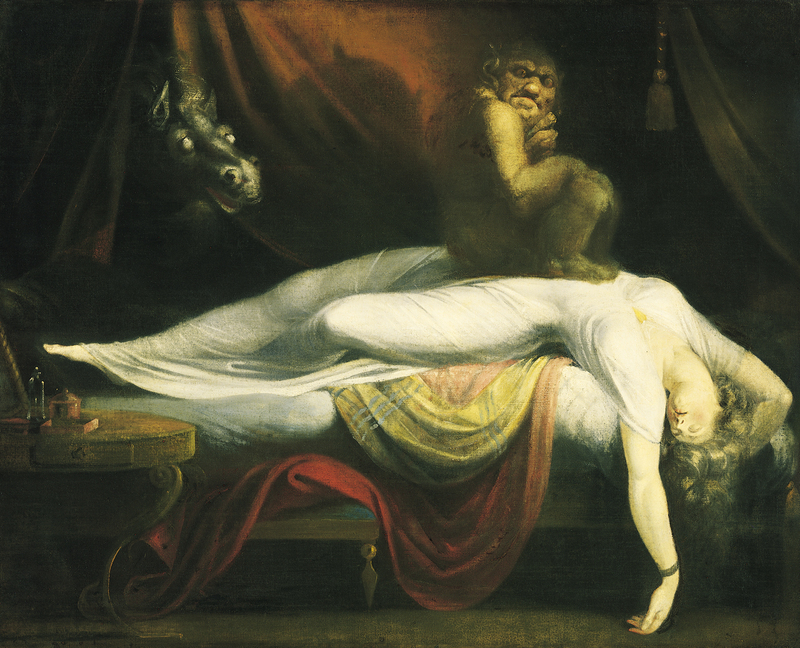 Were all the victims suffering from sleep paralysis? Probably not. I have no doubt that sleep paralysis served as the origin of the motif, but the motif has grown beyond the physical phenomenon. It’s become a part of the story of beings that attack in the night, and it’s been a part of the story for a very long time. This is not to say that people who tell stories of a great weight on their chests are lying or adding that element to the story because they think they should; however, the experience has become an expected element. We know that cultural expectations shape perception and memory. For instance, it has been suggested that some of the elements of Betty and Barney Hill’s alien abduction accounts were subconsciously based on science fiction television programs and movies. Certainly, the Hills’ story has influenced other accounts of alien abduction. The very fact that experiences that would have once been perceived as demon attacks are now interpreted as alien visitations suggests just how much cultural expectations influence perception. To return to the case of Sarah the vampire and her sister: this story is one of the earliest of the New England vampire cases. It concerns Stukeley “Snuffy” Tillinghast and his fourteen children. His daughter Sarah died of consumption, followed by several other family members. The bodies were exhumed. Only Sarah’s was found to be undecayed. Her heart was removed and burned. The deaths ceased (after one more). The story of the Tillinghast family was recorded nearly a hundred years after the events described, in Sidney S. Rider’s 1888 article, “The Belief in Vampires in Rhode Island.” Folklorist Michael Bell researched the stories and found some information that corroborated Rider’s story: Tillinghast did have fourteen children, and several, including Sarah, died of consumption in 1799. There were also discrepancies: Rider says half the Tillinghast children died, but, in fact, only four or five died. Rider also says Sarah was the oldest child; she was actually the tenth. Enough of the story was corroborated that it is plausible the bodies were exhumed and that Sarah’s heart was burned. However, there are elements of Rider’s story that are pure folklore and cannot be true. Some of these folkloric elements involve dreams. At the beginning of the story, paterfamilias Snuffy dreams that he has an apple orchard (which he did) and that exactly half of it died. This dream is presented as an omen of the death of exactly half of his children. Aside from problems of interpreting a dream as an allegorical prediction–or postdiction–the dream simply isn’t accurate: Snuffy lost plenty of children, but not half. And then there are the sleep paralysis dreams. We’ve seen that an unnamed sister dreamed of Sarah sitting on her body. This was a “continual complaint” that occurred every night until the sister died. Seven people, six siblings and their mother, dreamed every single night that Sarah visited them and pressed on them. Each of them had these dreams until they died or, in the case of the mother, recovered. These dreams, though they sound like sleep paralysis, cannot be explained by any real physical phenomena. It is not plausible that the family could have shared so many hypnopompic hallucinations. Like the prophetic dream, these dreams belong to the realm of folklore, not neurology. This case is extreme and was no doubt intentionally embellished by a professional writer. Nonetheless, we should keep in mind when we hear tales of alien abduction that folklore may be at play as well as sleep paralysis. Bell, Michael E. Food for the Dead: On the Trail of New England’s Vampires. Middletown, CT: Wesleyan UP, 2001. Kindle ed. N.p. Blackmore, Susan. “Abduction by Aliens or Sleep Paralysis?” Skeptical Inquirer May/June 1998. Clancy, Susan A. Abducted: How People Come to Believe They Were Kidnapped by Aliens. Cambridge: Harvard UP, 2005. Kindle ed. N.p. Kristov, Nicholas D. “Alien Abduction? Science Calls It Sleep Paralysis.” New York Times 6 Jul. 1999. Lindahl, Carl, John McNamara, and John Lindow. Medieval Folklore: A Guide to Myths, Legends, Tales, Beliefs and Customs. Oxford UP, 2002. Perkowski, Jan Louis. Vampire Lore: From the Writings of Jan Louis Perkowski. Bloomington, IN: Slavica, 2006. Thompson, Stith. Motif-Index of Folk-Literature: A Classification of Narrative Elements in Folktales, Ballads, Myths, Fables, Mediaeval Romances, Exempla, Fabliaux, Jest-Books, and Local Legends. Rev. ed. Bloomington: Indiana UP, 1955. This entry was posted on Sunday, March 10th, 2013 at 2:38 am and is filed under art and science, mythology/folklore, paranormal, Superstition. You can follow any responses to this entry through the RSS 2.0 feed. You can leave a response, or trackback from your own site. Most abduction stories are probably hoaxes. No doubt some are sleep paralysis hallucinatory episodes which often are exaggerated. The rest though? Who knows. I’ve given up on skepticism because most skeptics are rude and it is a biased discourse that does involve subjective thinking, tunnel vision, and ironically belief. My new thing is trying to be objective and also not believe. Belief does not require facts or truth, just faith. Where facts are self-evident. In the absence of facts, just don’t believe. Entertain or ponder an idea and measure it up to what we truly know. Theories are not facts either but the more supporting evidence the closer they can be to the truth. One theory should never be used to dismiss another reasonable theory just because it is more popular due to the politics involved. So those are me new standards. Fact: UFOs are real. Not fact: UFOs are alien spacecraft who abduct people. The two are not synonymous. The latter has no reliable evidence, but there are claims out there. Again most are hoaxes. Hoaxes can’t explain all claims. Are all of the remaining claims sleep paralysis? Sleep paralysis hallucinations almost always take place in the place you fell asleep in where a lot of abduction stories do not. That doesn’t mean there isn’t another explanation. Lucid dreams, for example. And false memories due to hypnosis. Lucid dreams can accompany sleep paralysis. Concentrating on ‘spots’ in your closed-eye vision can keep your mind awake as your body paralyzes leading to the tingles, exploding head syndrome, and lucid dreams. Or terrifying sleep paralysis hallucinations. There could be a chance that aliens are really abducting humans. It isn’t likely but it isn’t impossible. Your right in stating that sleep paralysis does not explain the phenomena of witch, possession, the Witches Sabbat and Alien Abductions in full. It appears that such states of mind may indeed be at the root of the phenomena. Certainly things can acquire a life of their own independent of some sort of basis for the phenomena to be explained. One of my “favorite” stories of the witch craze is the story of a man in southern Germany who one day went to a witch hunter / inquisitor and confessed to being a witch. He also confessed that his wife and 5 children had also attended witches sabbats. The kids and his wife vehemently denied the whole thing. The man was matter of fact and quite sober. His testimony was accepted and he his wife and 5 kids, (One c. 8 years old) were all burned alive. The argument was made that why would he make up stuff that would result in the death by fire of himself and his entire family. Now if the guys confession is anything to go on he was quite sober, rational and sensible and he reported going to the sabbats like it was going for a walk. In other words he seemed to be perfectly sane and not a nut case and his version of his entirely made up events do not seem to involve sleep paralysis or anything like hallucinations. So what the hell happened? And remember his confession resulted in the death by fire of himself and his whole family. I have no idea why someone would do any of this but it is interesting to record that the man knew in detail all the familiar tropes and narratives of the witches sabbat and the pact with the devil etc. Somehow he became convinced that this sort of narrative fitted his life and the fact it destroyed him and his family was just “incidential” in some fashion. It is often said that the narratives of satanic ritual abuse and alien abduction can’t be made up because why would someone make up and believe something that was so unpleasant and terrible. Well I’m no reader of the deeper recesses of the human heart but here is a case of someone believing something utterly absurd and destroying himself and his family in the process. So sorry people do make up stuff that hurts them. The record that records this memory actually states that such voluntary confessions “prove” the reality of the witches sabbat, the pact with the devil. Maybe this will be of use for you. When I was two years old and we lived in a rented apartment with a very dark bedroom, I once woke up and saw a crocodile on my bed. I was madly afraid of crocodiles at that period. I remember quite well that it said ‘wa-wa-wa’ and bit my foot. The problem is that now I am aware that the ‘crocodile’ looked rather like a toad… (I did not know the word ‘toad’ then). So there is an experience which is perfectly false, because there are no crocodiles in Moscow, breaking into your bedrooms! However, it was very vivid! Haha! That’s great! Brains are so funny. Objectively, sleep paralysis, with so much research that was done on the subject, fits the bill to explain alien abductions. Carl Sagan referred to this as “inner space.” But because the subjective experience can be so real to the experiencers, it is virtually impossible to convince them otherwise. The hard-wiring of human beings that provide for these experiences to occur is the culprit. When it comes to the incubi and alien abductions, their motifs reflect their respective cultural settings and time periods. Remember, dream states have different rules than waking reality. I’m just calling for being honest where the evidence goes, and the evidence shows that lucid imagery belongs in the science of psychology, not in beings from another world. That other world, simply stated, is the result of altered consciousness.